Fancy a leisurely glide down through wide green pastures and shady woodlands? If so, this is the ride for you. The ride starts at Craigieburn Station and finishes at Pascoe Vale Station. After passing wetlands adjoining the train line, the ride goes alongside Lake Mcivor and past more wetlands before entering linear parklands amongst houses. This is the start of a long downhill run through wetlands and parks towards Moonee Ponds Creek. As the ride continues, the parklands open up into the Broadmeadows Valley Park, a very wide swathe of grassland where the flanking houses recede into the distance and you can imagine yourself in the middle of the country. 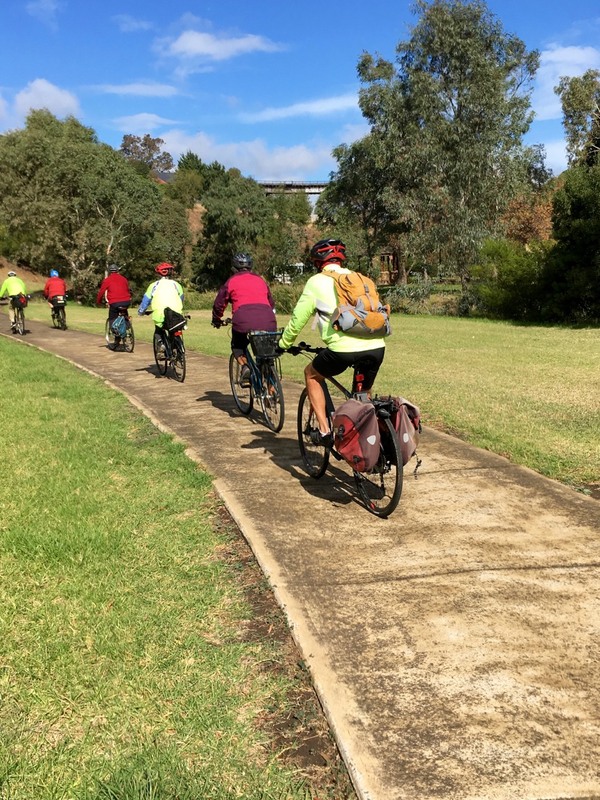 The ride continues along the Yuroke Creek, and then the Moonee Ponds Creek and the Jacana Wetlands. Downstream from the Jacana Wetlands the creek is flanked by trees, making a pleasant finish to an invigorating ride. There is a café at the end of the ride and there are picnic tables in the Broadmeadows Parklands. There are toilets at Craigieburn Station. After a short ride on the road, the ride is all along bike paths. It is mainly downhill or flat. The route has very few road crossings as there are underpasses under most streets. The ride starts on the western side of Craigieburn Station. As you exit the station turn left onto Hothlyn Drive. Ride along Hothlyn Drive until you reach Newhaven Road at the 4th roundabout. Turn left and ride the full length of Newhaven Road. Turn left at the first intersection into Limpopa Square. Ride along Limpopa Square and straight ahead onto the bike path that connects with this. At the end of the bike path turn right to follow onto the path alongside the railway. Ride along the railway until you reach the transmission lines. Turn right at the next intersecting path. Follow the path around Lake Mcivor and under Donald Cameron Drive. Turn right at the next intersection so that the next lake is on your left as you pass it. Turn left at the next intersection into Marsden Walk, a narrow strip of parkland flanked by houses. From here to Western Ring Road, the you should go downhill as much as possible and use underpasses whenever there is a choice. Shankland Reserve with 2 lakes. Use the underpass under Somerton Road to enter the Broadmeadows Valley Park. Ride downhill into the park. Eventually the Yuroke Creek makes an appearance. Do NOT turn right onto the Yuroke Creek Path. Keep the creek on your right as you pass a covered picnic table. Head up a hill to another picnic table. Resuming the downhill glide, the path splits into two. Turn right to cross the creek. Take the first turn left and resume the ride with the creek on your left. Cross Dimboola Road and then cross a small arched footbridge. Continue downstream with the creek on your right. Go under another underpass. Continue straight ahead under the Western Ring Road. Follow the Moonee Ponds Creek as closely as possible through the Jacana Wetlands, keeping the creek to your right. Stay on the left of the creek until the path ends. Turn right and cross on the footbridge to pick up the path on the other side. Follow the creek downstream until you pass under Pascoe Vale Road. Cross over the creek at the next bridge to get into Gaffney Street. Pascoe Vale station is just along Gaffney Street on the right. Continue along the Moonee Ponds Creek trail for 9km until it meets Capital City Trail West at step 7 near Flemington Bridge Station. Turn left to go towards Royal Park and right to go towards the city. riding over to the Upfield Trail. Turn right just after Pascoe Vale Station from Gaffney Street into Burgundy Street. At the end of this street turn left into Ohea Street. Wheel your bike up the very steep, but short, hill. Then coast along this bike friendly road to reach Sussex Street. Cross the road and use the shared footpath to continue along Ohea Street to the Upfield bike path alongside the next railway line (500m north of Coburg Station). Turn right onto Upfield bike path and ride to Batman Station. Then follow Great Mediterranean Cake Shop Ride 1 steps 9 to 15 south towards the city. Note that at the star on the map there is a new section of bike path. At this point, do not cross the bridge. Continue straight ahead.